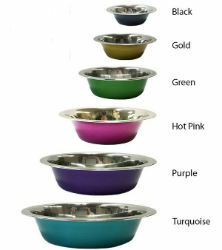 The same standard stainless steel bowls now come in Colors! Black, Gold, Green, Hot Pink, Purple, and Turquoise. Made of rust and scratch resistant Stainless Steel with a smooth rolled edge. They won't absorb odors, and are easy to keep clean. Sizes range from 8 oz. to 160 oz. 8 oz. 16 oz. 32 oz. 64 oz. 96 oz. 160 oz.